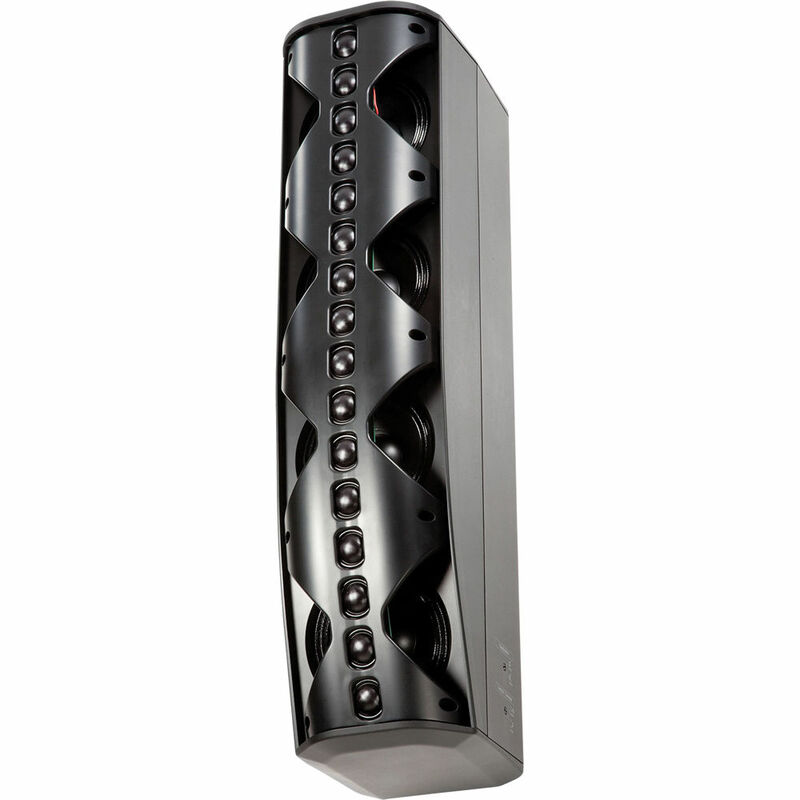 The black CBT 70J-1 from JBL is a 2-way line array column loudspeaker, ideal for use in auditoriums, lecture halls, stadiums, theme parks, and more. The unit features four 5" high-power low frequency drivers and sixteen 1" soft dome tweeters to provide plenty of power and a wide frequency response. The asymmetrical vertical coverage provides consistent front-to-back sound levels, while the patent-pending Constant Beamwidth Technology provides constant directivity and reduces out-of-coverage lobing. The vertical pattern coverage is switchable between 45° and 25°, allowing you to choose the best use for medium-throw or long-throw applications. Switchable voicing provides a flat response in music mode and a mid-range presence boost in speech mode to accommodate music and speech programs. Built-in SonicGuard technology provides overload protection for HF devices. This model includes an improved mounting bracket that affords enhanced aiming flexibility and a stronger grille. Box Dimensions (LxWxH) 35.45 x 13.3 x 12.0"
CBT 70J-1 Line Array Column Loudspeaker (Black) is rated 3.0 out of 5 by 2. Rated 5 out of 5 by Robo from Useful for sound people who know what they are doing Used this product in a number of difficult acoustic situations. Very effective in highly reverberant spaces. Some bone head rocker sound people who don't get physics have no idea how these work so a scared of them 'because they don't have a horn'. Don't listen to those idiots - these speakers are great, and designed by one of the best speaker engineers that has ever lived! Rated 1 out of 5 by Perry the sound guy from Overpriced Foolishness A crackpot creation, very inefficient. The vertical coverage switch simply turns off the top and bottom pairs of tweeters, making it even less efficient. The music/speech switch goes from small and tinny to small and muddy. Easily outperformed by a cheap 12 2-way. Certainly NOT worth the price. If you want the letters JBL on the front, use the CONTROL series. Still overpriced but much better sounding. There is a reason why PA speakers have horns, They sound better, have better projection and pattern control, and are more efficient. And cost less than this harebrained blunder. The RMS power rating of 500 watts seems over optimistic. That would be 125 watts per little 5 speaker. They obviously spent (or wasted) a lot of time on this thing, but like a violin made of mink, it serves little purpose.